The Camper Care team works day and night to ensure all campers receive the support they need to be successful during their time at camp. They are the "moms" when the parents aren't around. Their job is to give advice and support to our staff as they care for our campers. They are also tasked with keeping in touch with parents throughout the summer to ensure that they get responses within 24 hours to their questions and that they are informed of anything they need to know while their children are at Camp with us. Sometimes, as you can imagine, we deal with behavior issues at camp. Living in large groups and sharing a bunk with 10-15 other children can be daunting to some kids. We are here to help them adjust and manage their behavior in this new environment. Sometimes behavior needs modification. 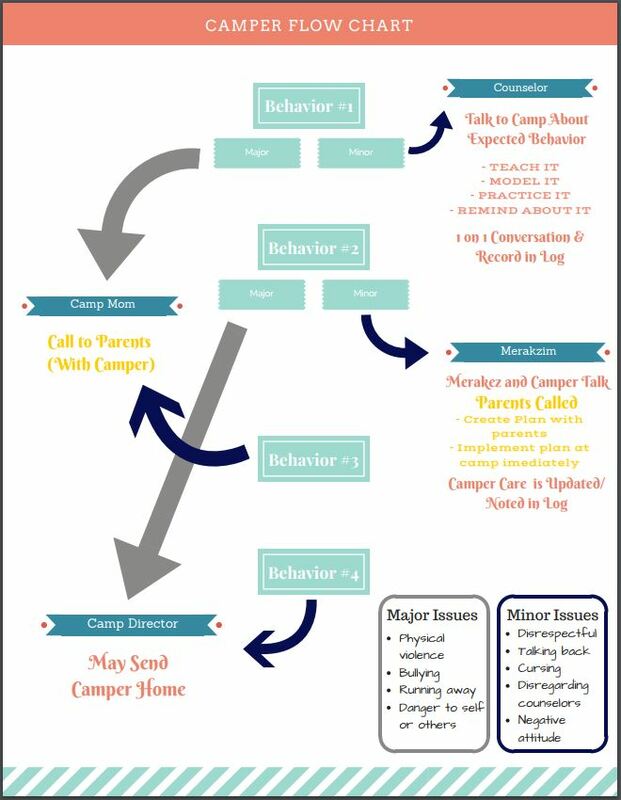 Our camper flow chart - posted below- spells out our detailed system when it comes to inappropriate behavior at Camp. Please review the details to ensure that you and your camper understand the expectations at CYJ.